I nod and continue fishing through my closet for cold weather gear before telling my wife I’d be back in a few hours. “Have fun!” she says with a sarcastic tone that suggests she’s convinced herself that her husband is insane — and I probably am. You see, I play in two leagues. One is outdoor, 8v8 and the other is indoor 5-a-side with no walls. Both teams are relatively competitive in their own ways, but the whole purpose is to just play. Both leagues play on Sunday. One in the morning and one on Sunday evenings, which makes Monday morning at the office full of reminders of how the opponents in these leagues might as well take to the field with meat tenderizers. Once at the field my teammates look at one another with that “what the hell are we doing here?” look but that quickly fades as we play. I suppose as I get older I’ve learned to appreciate the simple act of playing and having something to look forward to in the mornings each weekend. Looking at the current state of youth soccer, I wonder if this generation of players regards the sport more as a chore than a passion. This feeling was reaffirmed this past Sunday night as I waited for my indoor game while I watched two of the “elite” teams (from the same club) in the area scrimmage. What should have taken one touch took three. The speed of play went from gelatinous crawl to breakneck kick-and-run chaos, or as we call it in America, “hustle”. The overall level of play was low enough to get stuck on the bottom of one’s shoes. Players dribbled instead of passing. One parent yelled, “Great creative play, Joe!” as a player, presumably his son, attempted to dribble out of the back only to lose the ball and shanghai his goalkeeper. Another player tried the most ridiculous and pointless moves I’ve ever seen off YouTube. After the scrimmage was mercifully killed, I heard a group of U-16/17 players talking as they exited the field. I scoffed to myself. In my hand was a basic pair of Copa Mundials. Nothing special unless you count the kangaroo leather uppers. I thought to myself, this is what these players value. 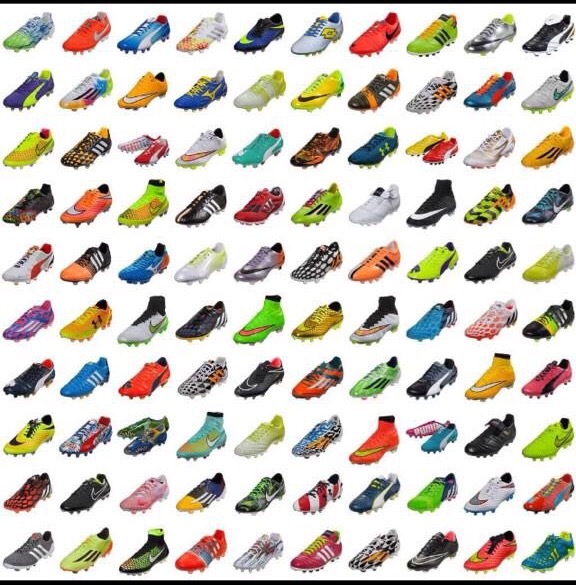 In case you haven’t noticed soccer boots are ridiculously expensive and incredibly plastic these days. The Magistas retail for $275 and the Elasticos retail for a more “reasonable” $150. The boots I use cost $90. I concede that the color spectrum is better represented in their boots, plus, I’m sure in 2015 they are a precursor to the Nikes in Back to the Future 2. I’d venture to say most players study this more than an actual training diagram these days. To me, it seems that today’s player is more concerned with looking good than playing well. I recall playing in an ethnic league named after famed Italian immigrant, Umberto Abronzino in San Francisco’s South Bay when I was younger. The league itself was full of players and teams with limited resources and money. I remember opposing Hispanic teams never had sidelines full of screaming parents and when I asked a friend on one of those teams why, he told me most of the parents worked multiple shifts in factories in South San Francisco or were migrant farmers near Hollister and San Juan Bautista in San Benito County. Several years on, closer to my new home in Illinois, I played pickup games with Polish immigrant workers in an abandoned warehouse in Chicago’s “Polish Triangle” near St. John Cantius Catholic Church when I was in high school. After each session, the older guys would drink beer before putting on their steel-toe work boots and heading off to another shift in a factory. These were serious players, too. However, this isn’t about the shoes. Here’s what I know: if a player can’t do the simple things [near] perfectly, they won’t be successful no matter how much their footwear costs, how fashionable they think they are, or how many YouTube videos they watch of Neymar, Ronaldo, and Ibrahimovic doing insane tricks for Nike. Naturally, the simple things include passing and receiving. But that’s low-hanging fruit. Players with any sense about them who want to improve do the requisite things really well. At the top level, players are still assessed by how well they do the basics, which have to be perfected not just occasionally, but every time. Great players are seldom judged on their current abilities, but rather on their capacity to grow and learn. Professional scouts don’t care that a player can dominate in their current age group, they want to know if a player can dominate at the next level and how soon that can happen. Here’s another thing that I know: true progress takes time and repetition. Every single great player I’ve had the honor to play with or against that was (or still is) able to earn a living playing professionally worked at their game every day. Every. Day. When they weren’t playing, they were watching, studying how others honed their craft, reading about the game, and taking care of their bodies and minds. And when it was time to really take a break, they developed the ability to make that call themselves. But what of the rest of the playing population? You know, those who’ve already had their careers. As harsh as it sounds, the average American playing journey goes from “I can play anywhere because, well, it’s me!” to “I could have/would have/should have made it, but….<insert reason/excuse/injury/circumstance>” pretty damn quickly. Inevitably, most of us fall into category two, which is fine. That’s life and that’s the game. It owes us nothing. It pains me to say that by the age of 17 or 18, most really good American players are rapidly approaching their ceiling despite what mom and dad tells them they are “owed”. For some reason, Americans are still under the illusion that by the time a player is 21-24 they are still young in soccer terms (see first sentence). That is not young in the competitive landscape of world football (see paragraph two). This is young. Is Martin Ødegaard a phenom? Yes. Will he be the next world star? Barring injury or a serious decline in his progress (unlikely as he’s headed to Real Madrid), he should continue to excel at the game. So what is the takeaway? My uncle is a fly fisherman who lives in Eugene, Oregon. He doesn’t know anything about the game. But, he imparted on me some wisdom that is directly related to true soccer development. He told me that technique must be practiced to the point that it’s no longer practice, but part of the individual. To learn how to cast a fly rod, he took me to a park and placed a tennis ball at the end of a shoddy fly rod and reel and taught me to keep a cadence. The work was exhausting and frustrating. I kept dodging the incoming tennis ball because I had no technique. As weeks passed, I learned to do the little things well. As a result, I can keep the fly just above the water and catch fish instead of my line in a tree the reeds. In soccer, I took this lesson and applied to developing my technique. Minutes must turn to hours spent trying to hone this aspect of a player’s game. Deliberate practice on one’s weakness is a tried and tested method to ensure it turns into a strength. Another important lesson I learned from bow hunting is to practice twice what you need. In bow hunting this is simple. To best hit a target at 40 yards with consistency, I should probably learn to hit a target at 60-80 yards with consistency. That means strengthening up my technique, making tweaks to the training, and learning to focus. In soccer, this means training harder than the game. Don’t focus on what’s easy. When a coach asks that players go home and get 1,000 touches on the ball, get 10,000. Shooting at an empty goal before practice or taking potshots before a game makes you really good at shooting an open goal with no pressure. Why not work on the things that allow you to get in that position to take the shot? In essence, when I write these entries or coach a group of players I make a few basic assumptions. I assume the players who want to get better are doing so on their own volition. I also assume that when they train on their own, they are working at their maximum level of effort and concentration. Another assumption I make is that players understand that they cannot and will not be great at anything without being dedicated, obsessed, and committed to working at their craft religiously. The reality is I know assumptions are dangerous, but maintaining high standards is important. At the end of the day, no matter what gear a player uses or the circumstance they’re in, the players most likely to succeed are those who are consistent and persistent. The best players I’ve ever coached were the ones that were able to focus on tasks while still seeing the big picture. No amount of parental hope, helicopter treatment, and screaming will make it happen for a player. The game is played in between the white lines on the field. The kitchen table coaching sessions generally don’t help and they generally are more for the parent than the player. The best players have short term memories. Mistakes happen and they move on. They do not let negative thoughts sabotage their progress and deter their productivity. And when they do have doubts, they sure-up their mentality. Great players have been through it all — that’s why they’re great.